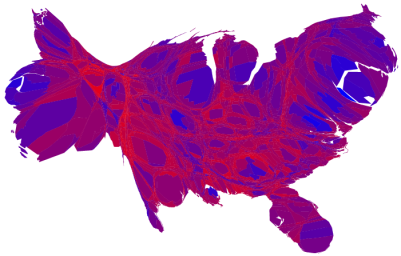 I found the Election Result Map site by Michael Gastner, Cosma Shalizi and Mark Newman at the University of Michigan particularly fascinating. They have created a number of visualizations (like the above) of the election results using a variety of methods which account for the population density differences throughout the country. Sure seems more accurate and telling than the area-based maps I’ve seen thus far in most post-election analysis. This page contains a single entry from the blog posted on November 9, 2004 7:17 PM in Bookmarks and Politics. The previous post in this blog was The Joys of iPodding. The next post in this blog is Pimp My Ride.